Daily Illuminator: More Goodies For Your Garage! May 20, 2013: More Goodies For Your Garage! You wanted vehicles upgraded with a perpetual motion machines, orgone engines, and broadcast power -- we listened! 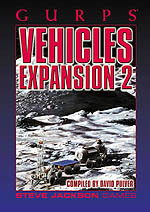 Newly released to e23, GURPS Classic: Vehicles Expansion 2 includes even more options for your GURPS Vehicles constructs. It includes new possibilities for propulsion, exotic components, performance options, and more. Compiled by virtuoso virtual mechanic David L. Pulver, GURPS Classic: Vehicles Expansion 2 takes your transports to bold, new realms.